It's been one of those weekends where the treasure that I found was eclectic and all over the place. 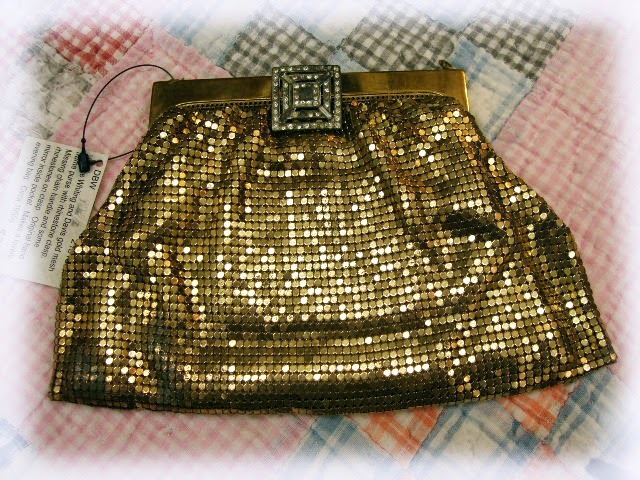 From auction wins, visits to local Goodwills and of course Vintage Village, I was a treasure finding fool. 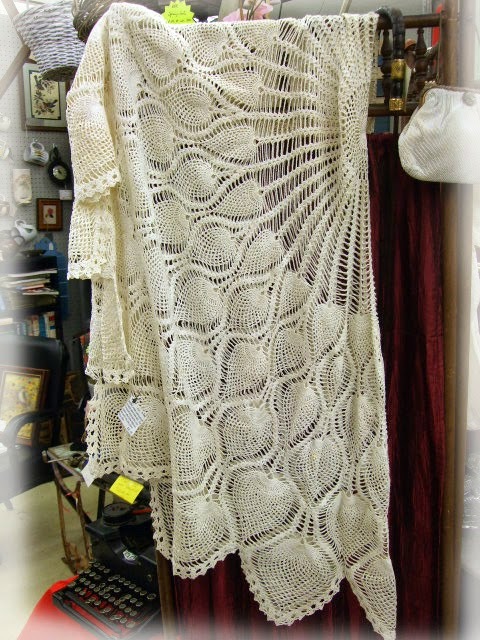 Gorgeous round hand crocheted in the popular Pineapple pattern of the 1950s, this table cloth is in lovely condition. 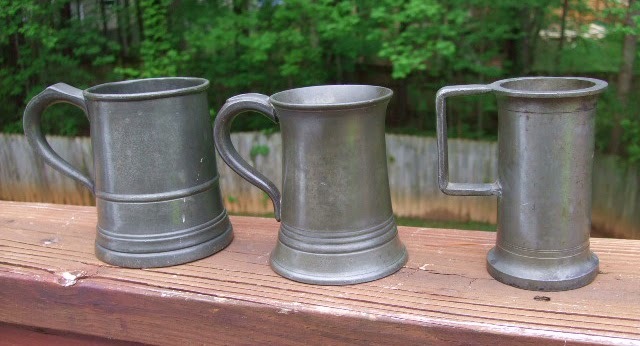 Set of three English pewter measures and all have their weights/measures inspectors stamps. 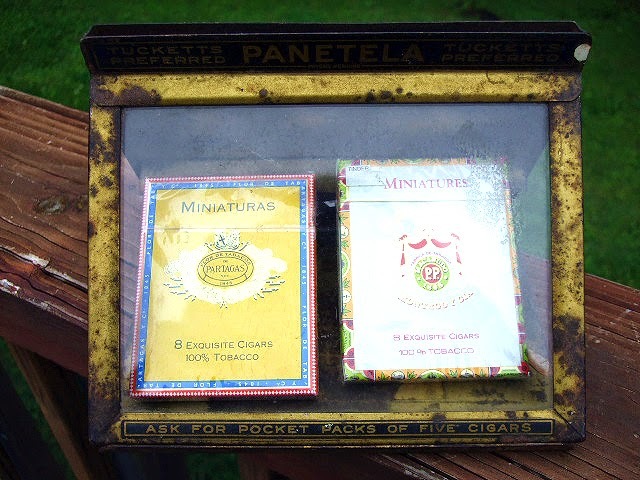 Rare, store display for miniature cigars was an auction win. 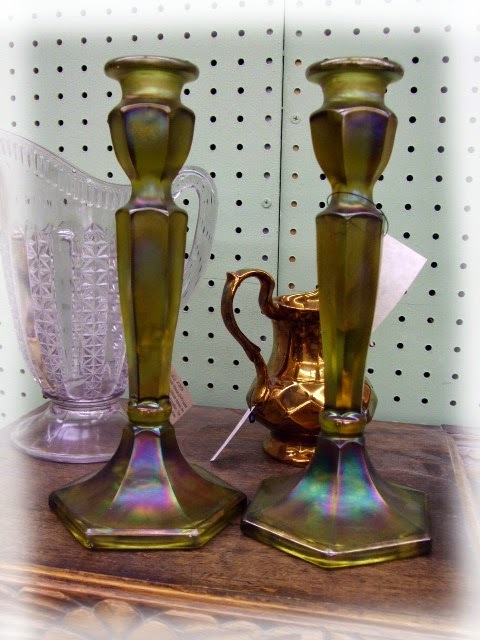 Adore prisms and this candlestick is extremely heavy with the thickest and heaviest prisms I have every come across. 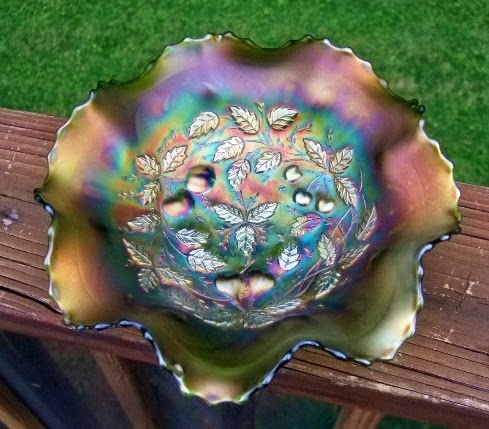 Full of rainbow fire, this came home to live with me. 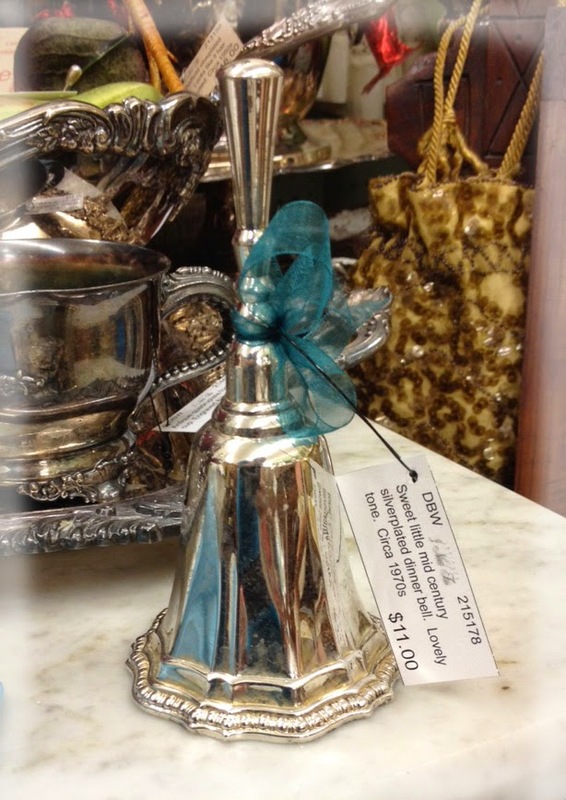 Sweet little silverplated bell was black with patina and a Goodwill find. 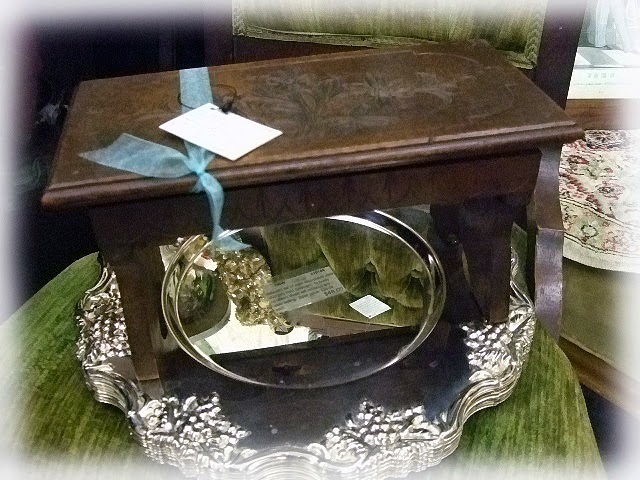 It polished up beautifully and would make a lovely way to announce the entrance of a new bride and groom. 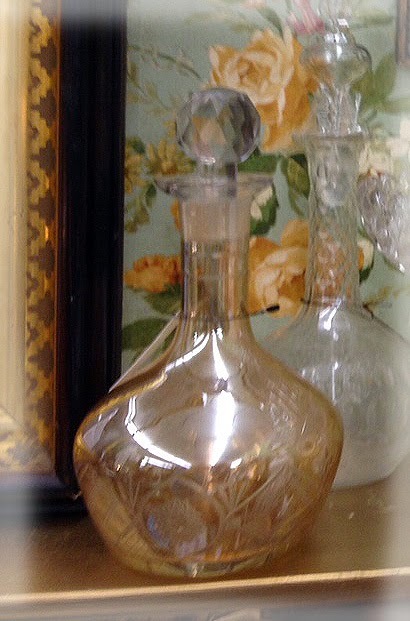 Lovely cut to clear, marigold decanter was another Goodwill find. Isn't she lovely? 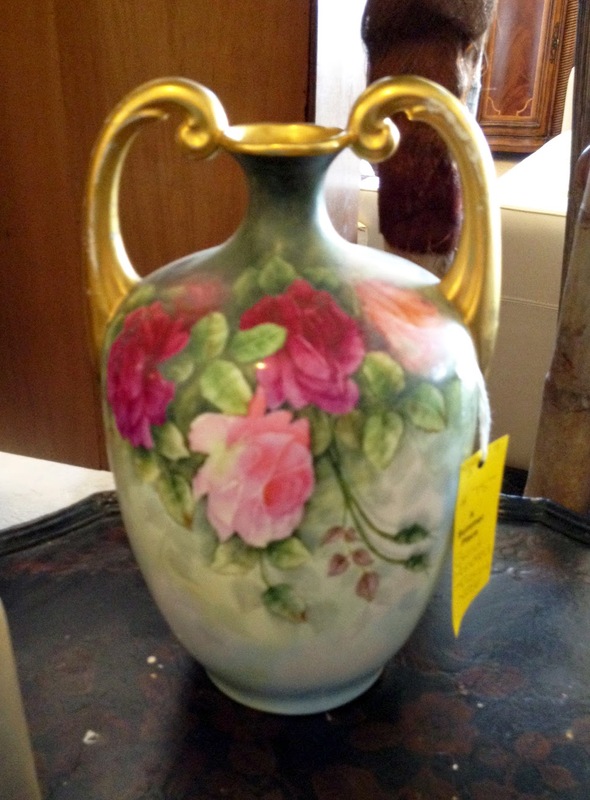 Pretty bust of a period woman makes a marvelous display for staging jewelry, so this is a piece I will keep for me. 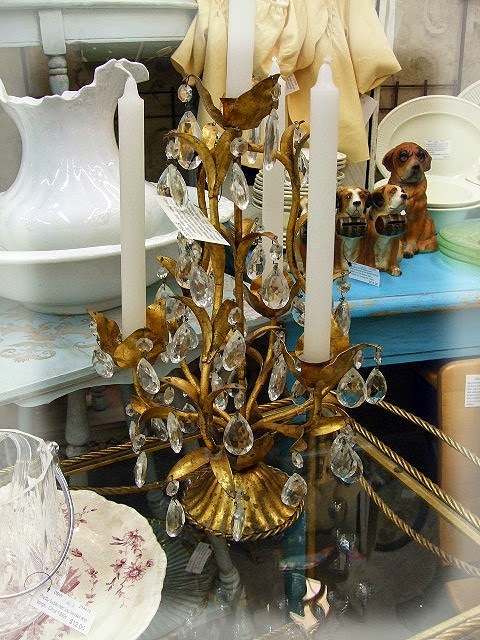 Adore antique carnival glass and my visit to Vintage Village garnered this lovely find. 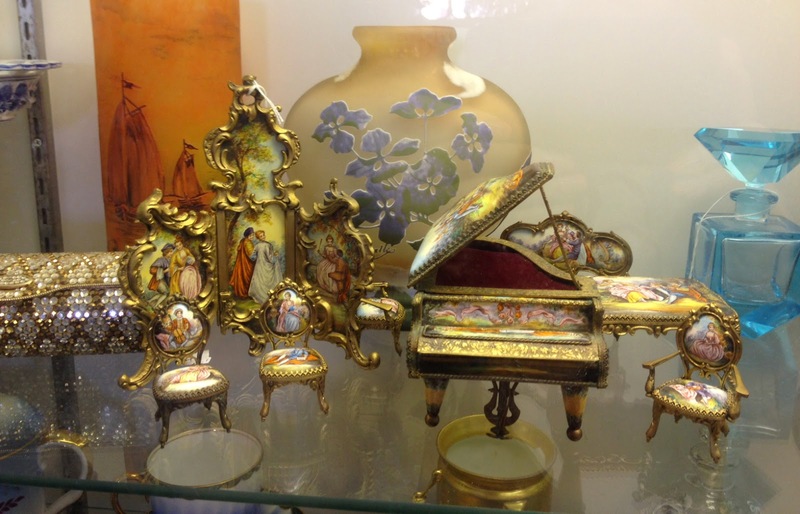 It is at home in my display case with other carnival glass pieces. Another find for me. Be still my quad loving heart. Another Vintage Village find that is now part of my personal collection and yet, another find for me. 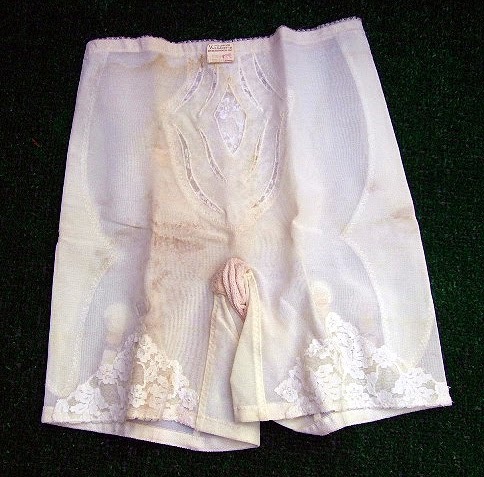 Nothing like a deadstock vintage girdle. 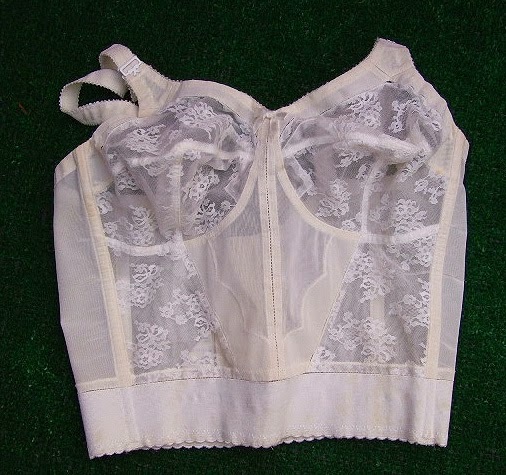 and it's little friend, a deadstock vintage, long line bullet bra. Both found at Vintage Village. A thrift store find, more deadstock merchandise. 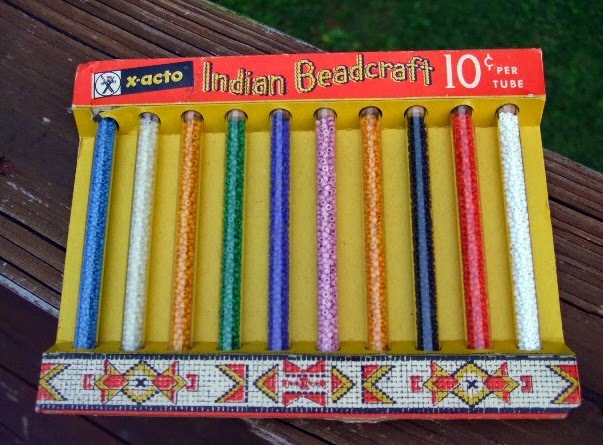 Vintage beads in glass vials in the original display card. 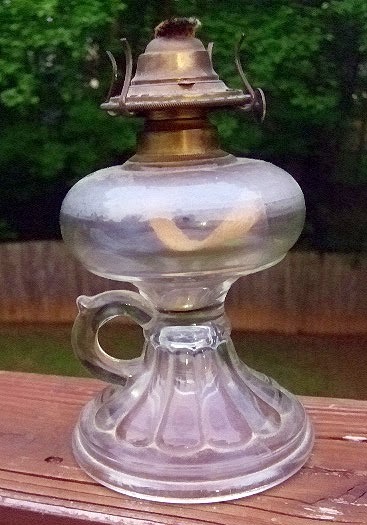 Marvelous finger oil lamp. 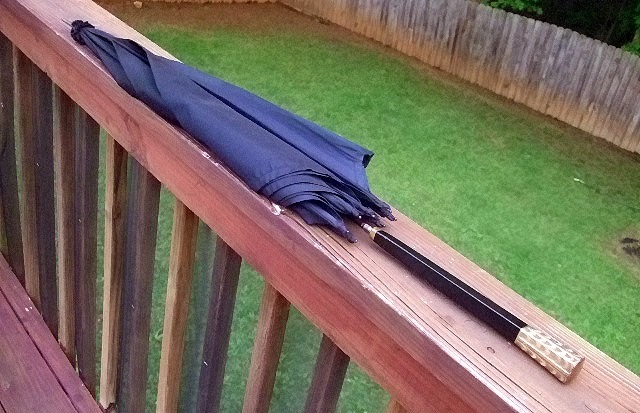 This is a keeper as I use them on my deck in the evening when the nights are gentle. Another find for me. How about this twin set of covered turkey dishes. 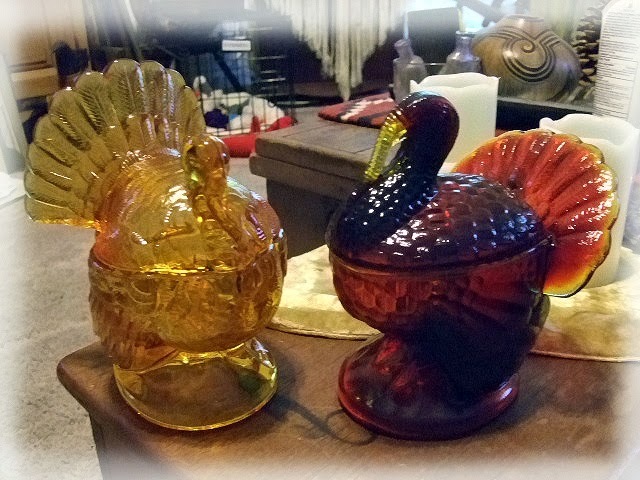 A Goodwill find, these will make their way to my booth space over Thanksgiving. 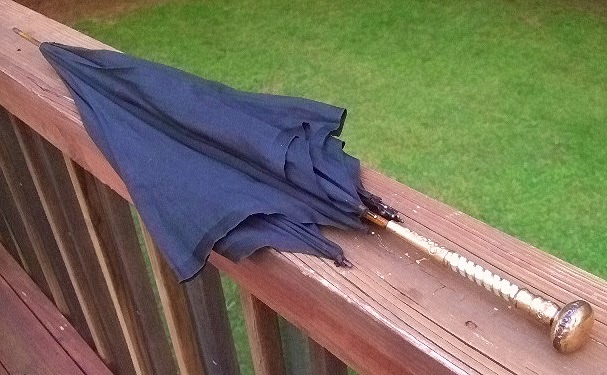 A pair of gorgeous, late Victorian umbrella's with rolled gold and mother of pearl handles. Both were found at Vintage Village. Both came home for me. Isn't she lovely? Isn't she wonderful? Gorgeous yard long dated 1914 was an auction win and she is now in my Victorian space at the Buford Queen of Hearts. Pretty set of three depression era luncheon plates were a thrift store find. 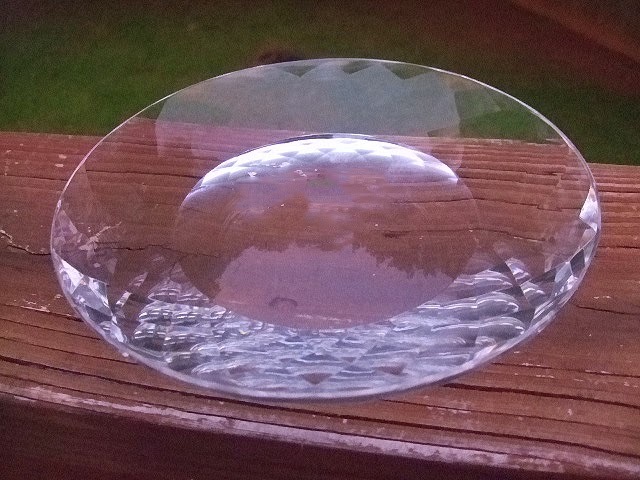 Pretty cut crystal plate is heavy and make a lovely candle support. 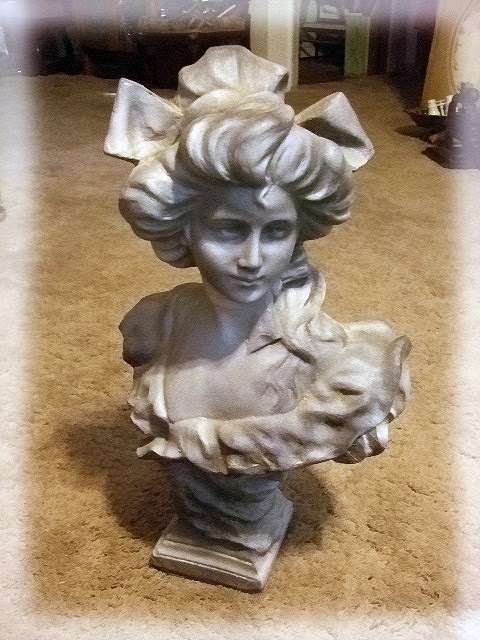 A thrift store find, I'm still on the fence about selling or keeping so for now, it is home with me. 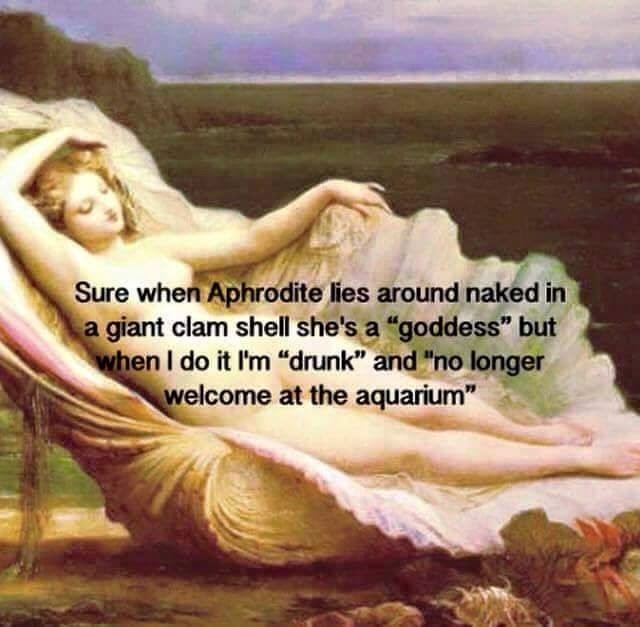 Ahh, spring is here and summertime is not too far away. Other than the thick yellow pollen that is in the air, on all outdoor furniture, the vehicles, the streets and the family pets, it is great to have warm weather again. Saturday was a lovely day for an auction so I hightailed it to the Atlanta Auction Company auction, had my number at the ready and just waited to see the hammer come down with a winning bid or "few". 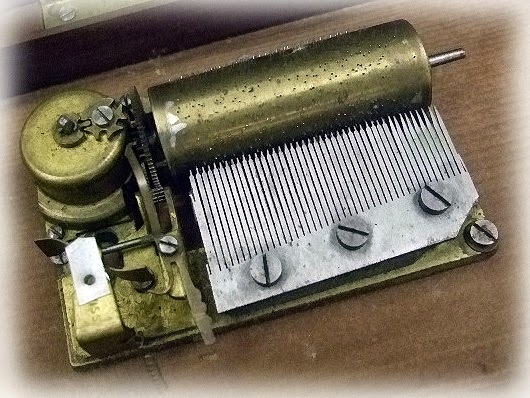 The tiniest little music box roller I have ever seen. These pieces always amaze me. Found this lovely quilt at an Atlanta thrift store. 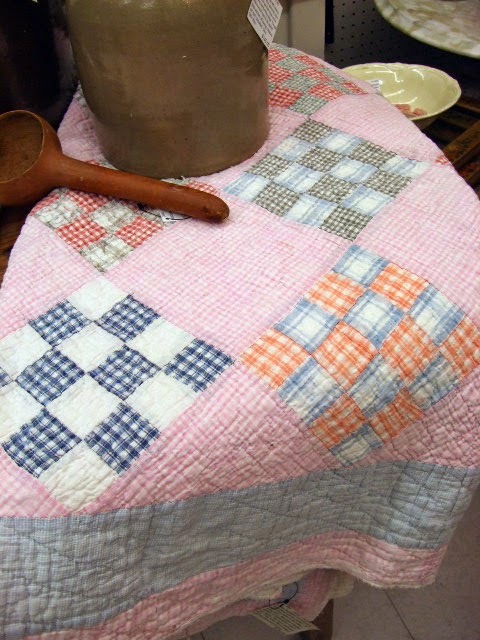 This 1930 quilt is a 16 patch that is hand pieced and hand quilted. 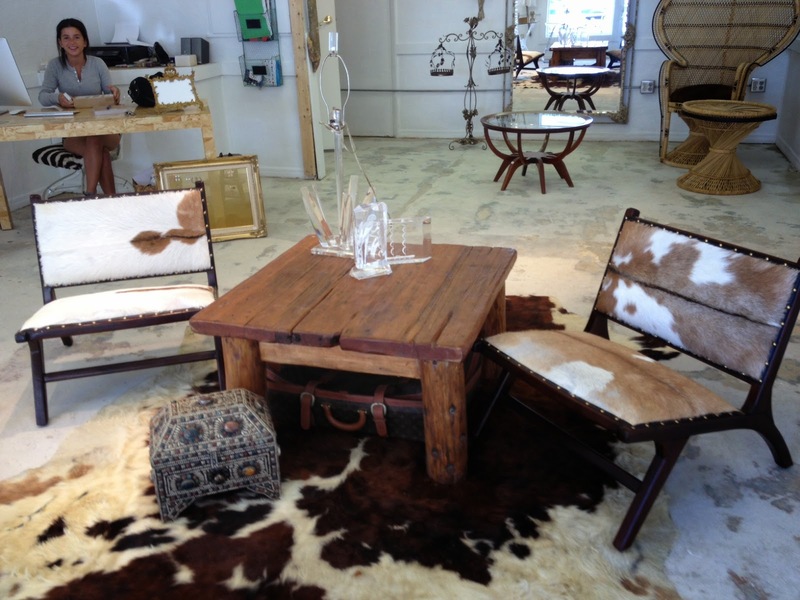 Looks great with the farm table. 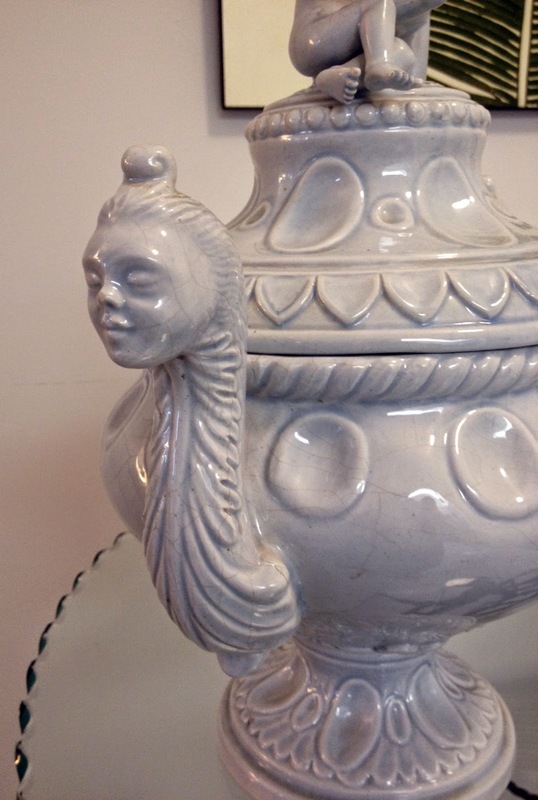 Huge, 6 gallon, Indian Head pickle crock by Louisville Pottery. 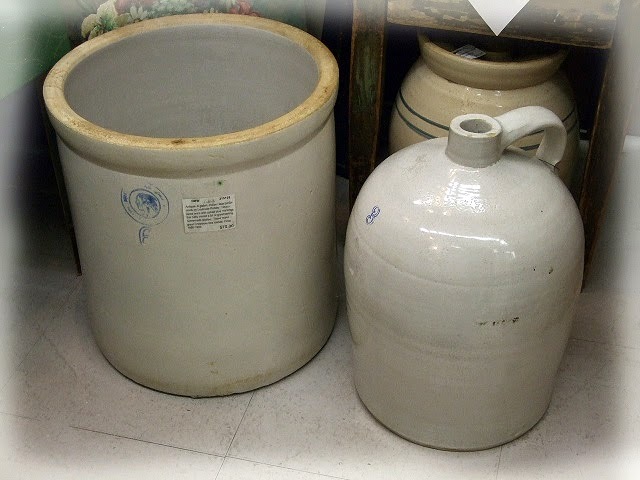 Heavy stone ware with cobalt blue markings, this baby stored a lot of great tasting, homemade pickles. I use them as Christmas tree stands and to store plastic grocery bags. 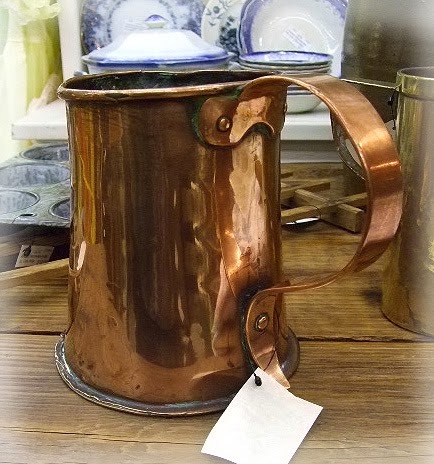 Early 19th Century, Antique English Copper Mug . Lipped, tapered body of brazed seam construction, the simple strap handle with attractive heart-like upper mount is beautifully made. Circa 1840s. 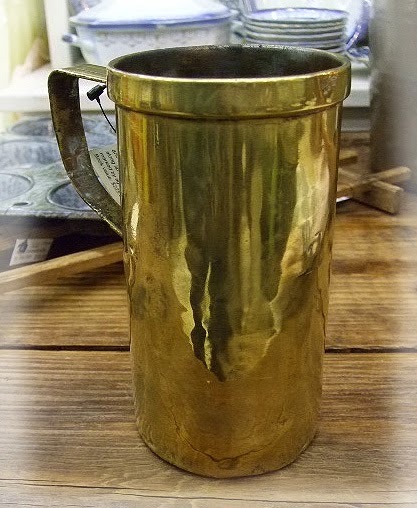 Mid 19th Century, Antique English Victorian Brass Measure. 1 l (L-lowercase) (litre) etched. Beautifully hand made copper rivets and with “Weights & Measures Agents marks along lip”. These measures were tested and marked by agents each year. Circa 1860s. 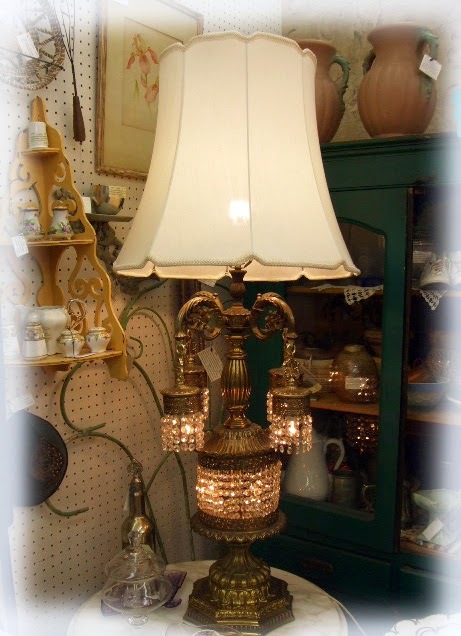 From primitive pieces to mid century, I was the lucky bidder with this gorgeous Old Hollywood, Regency lamp. 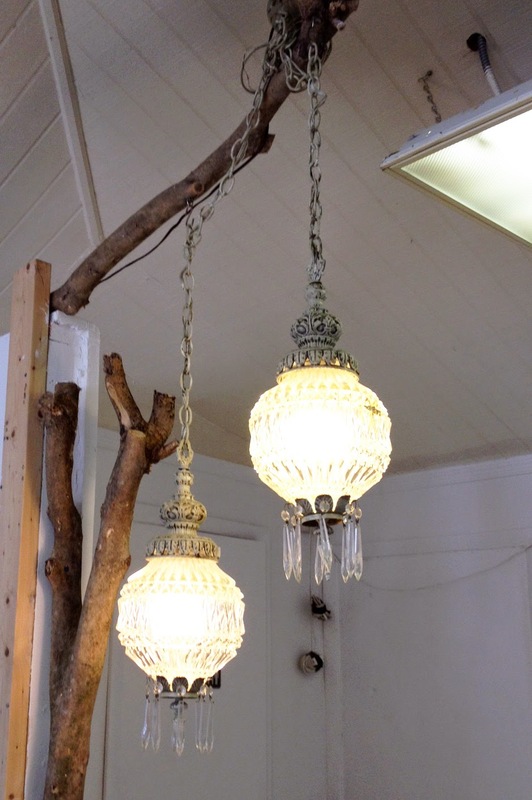 Huge, huge piece with two tiers of draped crystals and with original lampshade. 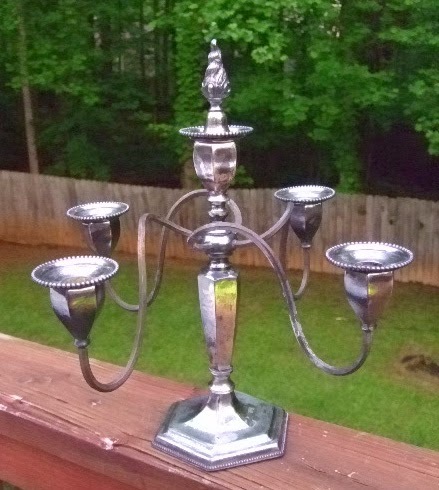 Close up of the base and the four small chandeliers. This is a heavy and substantial piece. 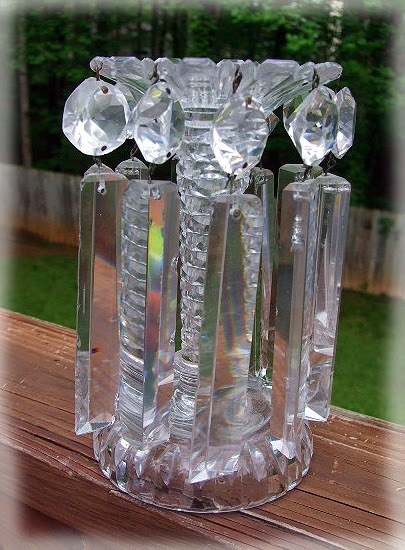 Pretty Italian tole and crystal prism four cup candelabra. 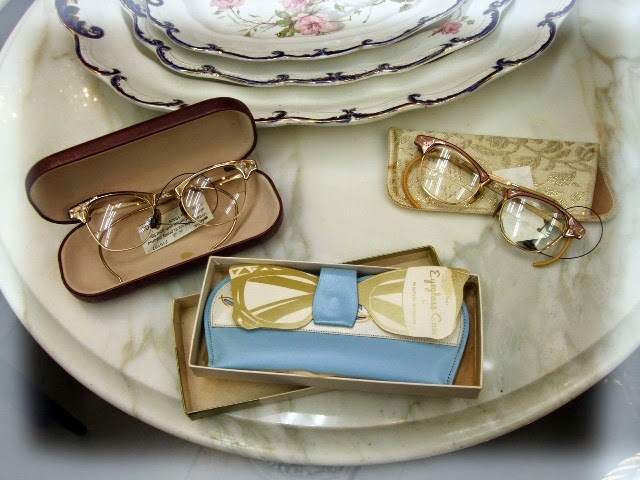 An assortment of vintage bifocals and NIB Princess Gardner leather eye glass case. Was the winning bidder of an assortment of vintage purses and it is the French led the way when it came to elegant beaded evening bags during the 1930s. 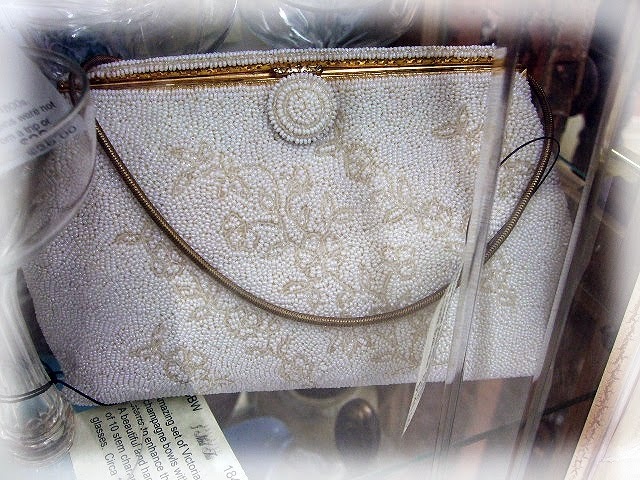 This lovely, “tone on tone” made in France, maker Carry, beaded evening bag looks like it has never been used. Pristine inside, it has a small change purse and mirror inside. Another French beaded evening bag with pretty seed pearls. Made in France. Some issues but still a great little vintage bag. 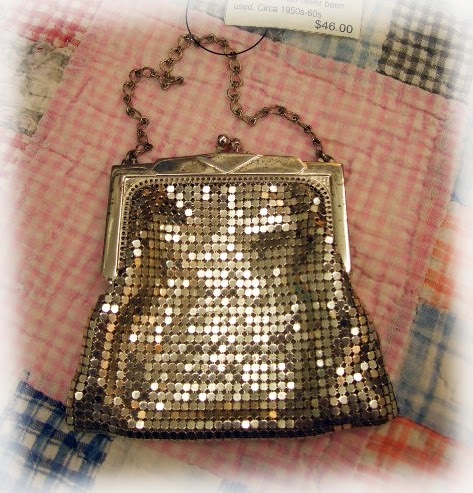 Lovely Whiting and Davis mesh bag with rhinestone clasp. Some issues, the chain is missing and three are missing rhinestones on the clasp, but it has such a great feel and the gold mesh is in great condition. 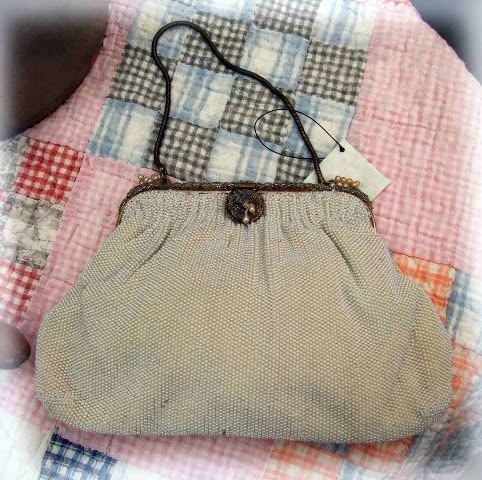 Like new, Whiting and Davis wristlet purse. This is small and very cute. 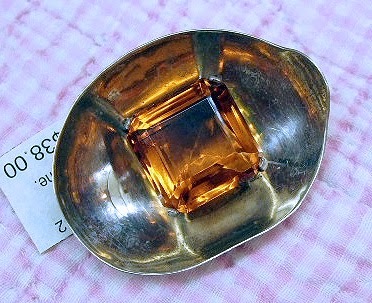 Sterling shawl pin with faceted topaz colored stone. 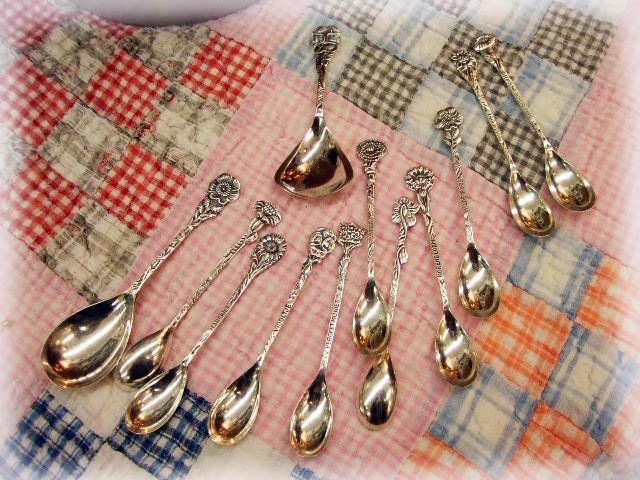 Nice set of ten, Dutch demitasse spoons and two sugar shell spoons. 800 Silver with a total weight of 143.3 grams, they are decorated with flowers of the Netherlands. They were in my displace case less than 2 hours before someone purchased them. Brought all of my wins/finds into my two spaces at the Buford Queen of Hearts and after I had restocked my booths, I did a quick run through the aisles. 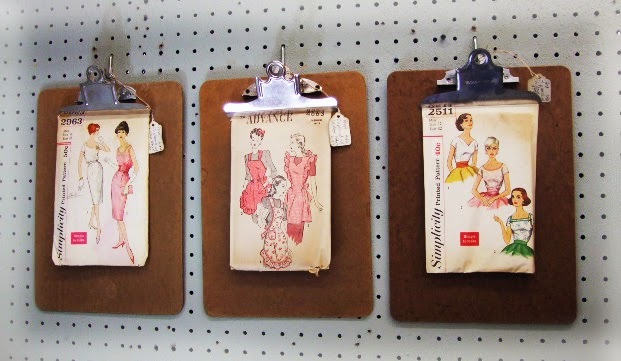 I stopped dead in my tracks when I saw how clever this dealer turned vintage dress patterns and vintage clipboards into art work. She simply slipped a dress pattern under the clipboard clip, and there you have it, instant art. One final win and this one was for me! 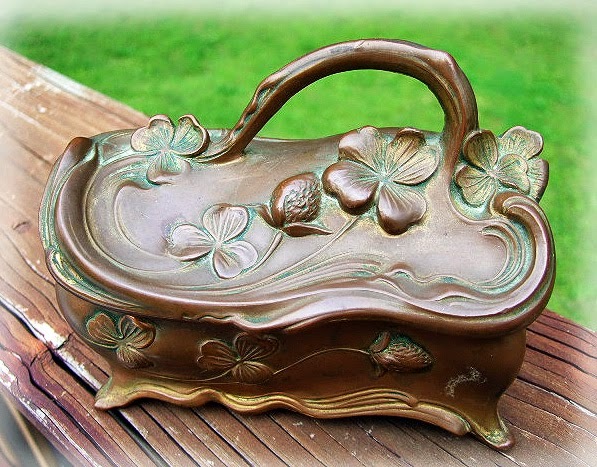 I adore these Victorian jewelry caskets and the clovers (notice the sole, four leaf clover for luck) is a shout out to my Irish heritage. My grandfather, Michael Francis Malone, immigrated from County Clair, Ireland in the early 1900s. 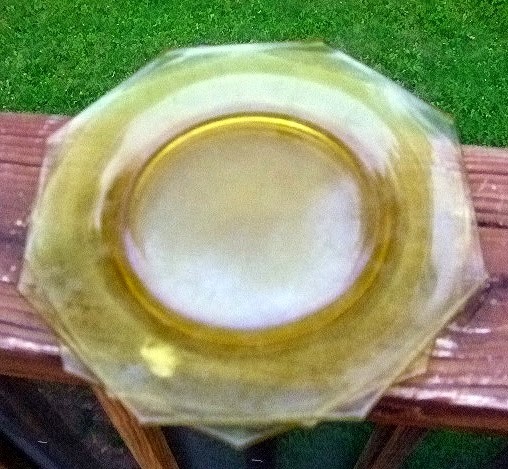 Most of the gold wash has long worn away from the copper base but I like it the way it is. Still has the original, pale blue silk lining. Took a little, much needed, PTO and flew to Deerfield Beach/Boca to see my baby sista. We always have a high ole time and my visit coincided with her 55th birthday. We used to live a few doors down from each other, but she has since moved to South Florida and I miss her daily. Thankfully, we Skype, email, IM and phone daily so we are always in touch, but there is nothing like spending time together doing the things we both love, the beach, the sea, antiquing and playing tourist. 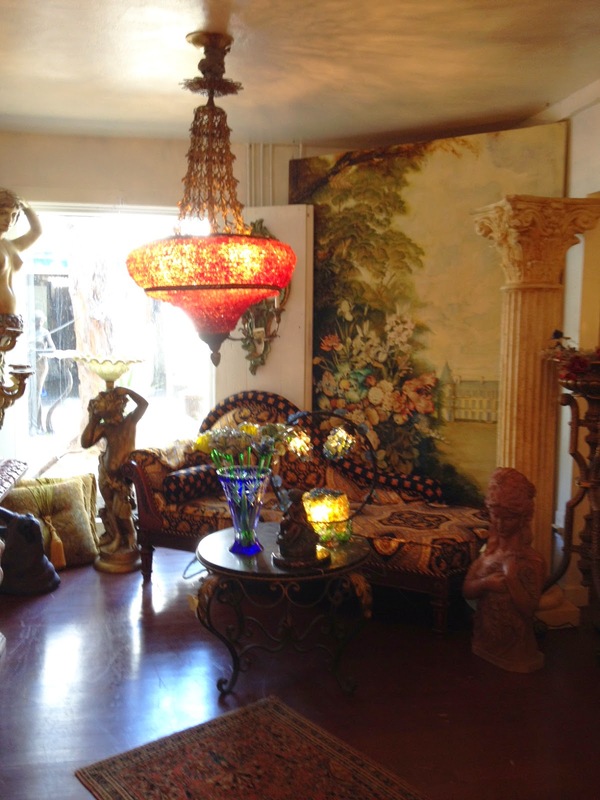 We dedicated one day to antiquing/fleaing and our first stop was at my favorite consignment shop in Deerfield Beach, A Summer Place Consignments. Debra, the owner, and I never met but have been facebooking for over a year. It was great to finally meet her in person and she is every bit as lovely as her friendly posts. 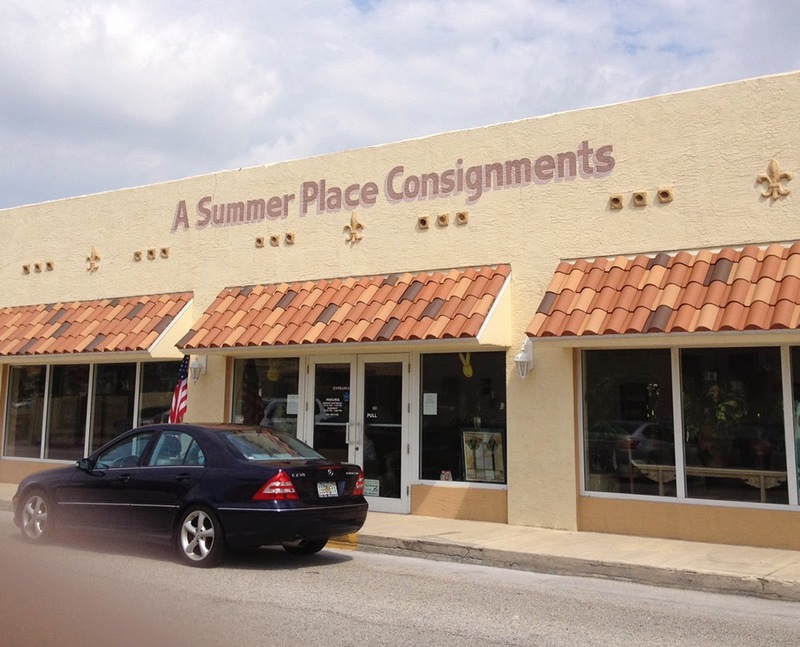 A Summer Place Consignments is filled with gorgeous pieces and at prices that are so affordable, that this is truly a place that you buy it when you see it or it will most definitely be gone within 24 hours. Sweet "Charlie" (girl) is the provides the shop security and is just too sweet for words. 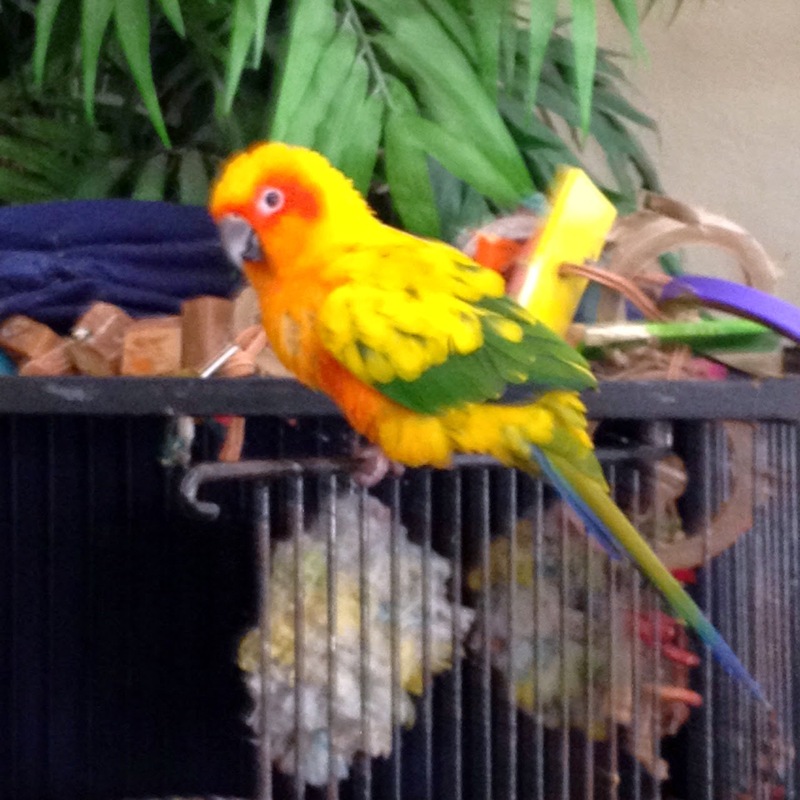 She is a busy little thing climbing up the cage and sliding down the pole non stop and chirping away. She watches everyone that comes in. 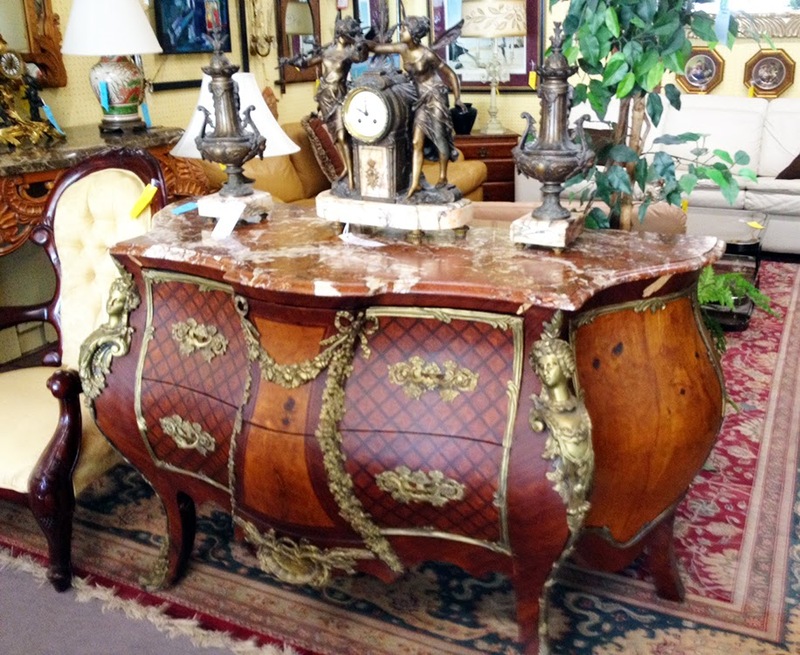 You will find every style of furniture period here and some pieces are just extraordinary. 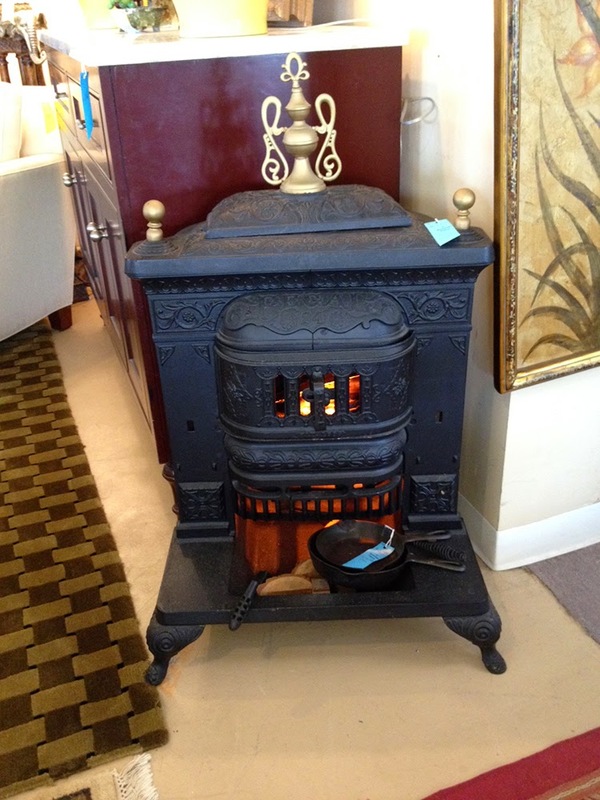 Brilliant use of an antique, cast iron stove. Has been converted to an electric fireplace so you can enjoy the look of a roaring fire without the unbearable heat in southern locales. 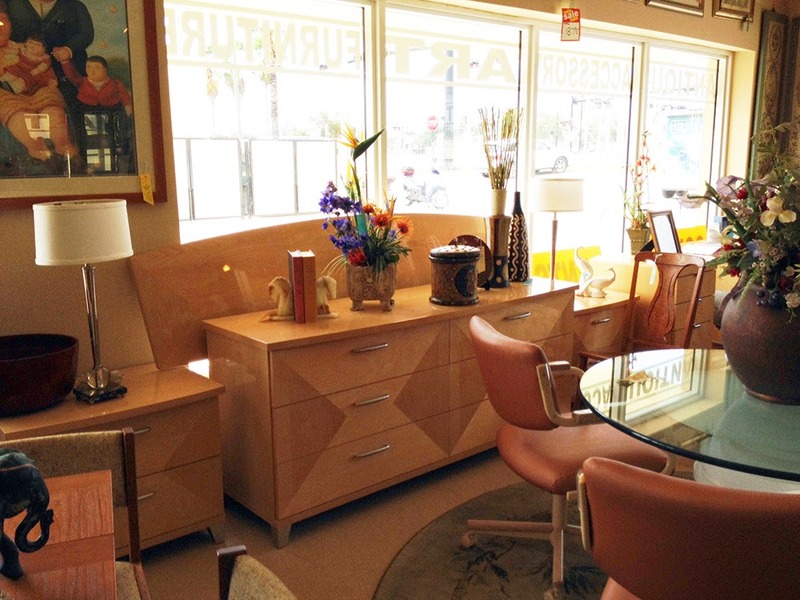 Beautiful, mid century bedroom suite, screams Mad Men. 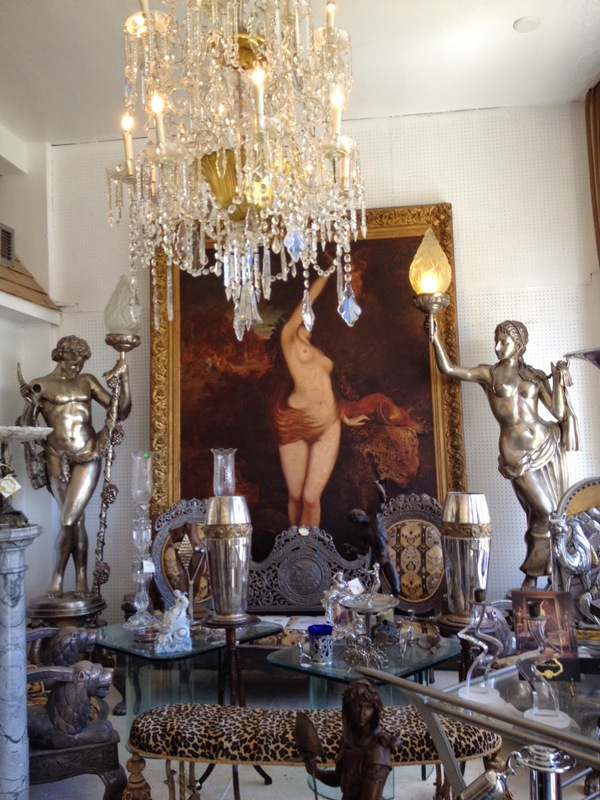 Throughout the many rooms you will find lovely decorative elements such as art pieces, antiques and amazing mirrors. 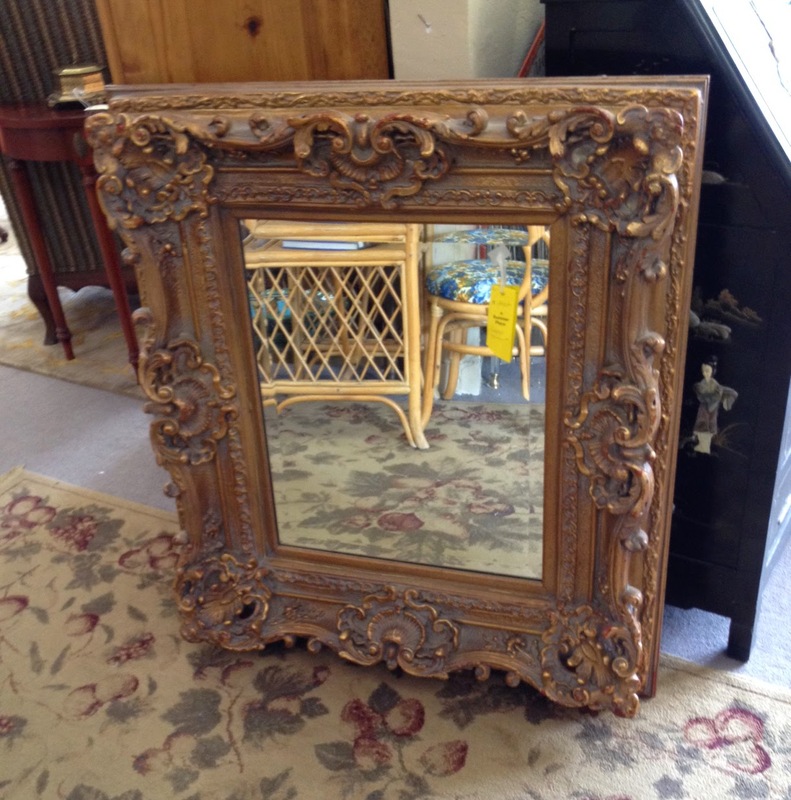 Lovely example of the many mirrors found within, I would have loved to taken this one home with me. 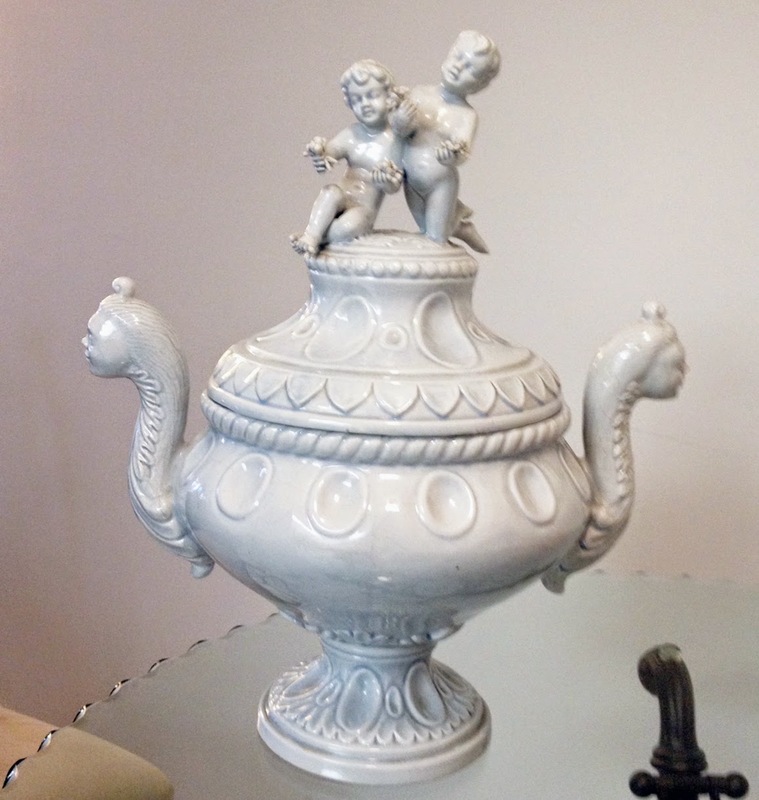 Now this gorgeous, Italian soup tureen did catch my eye and take my breath away. 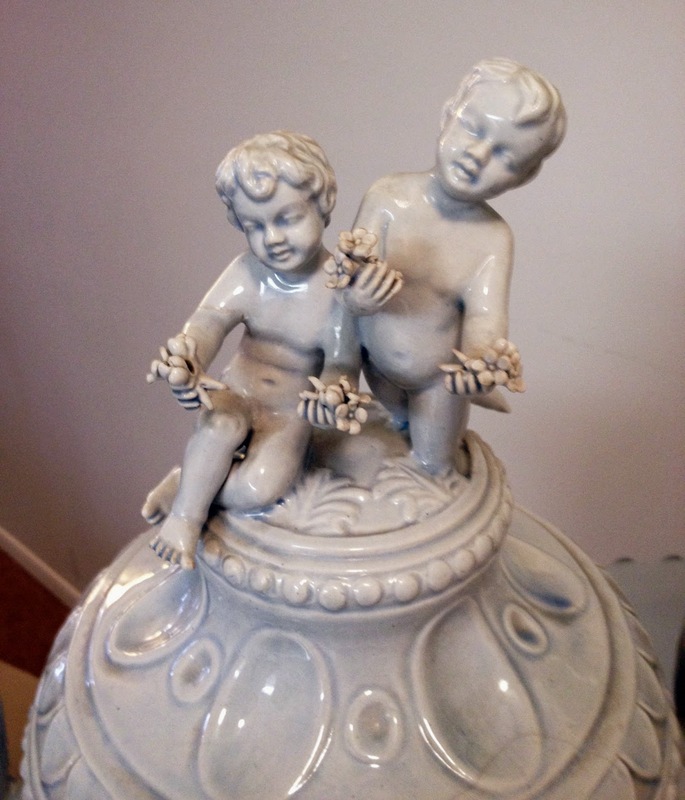 The mother ship of all soup tureens, it has unique head handles and cherubs tossing flowers at the top. I wrapped it in bubble wrap and carried it on the plane with me. 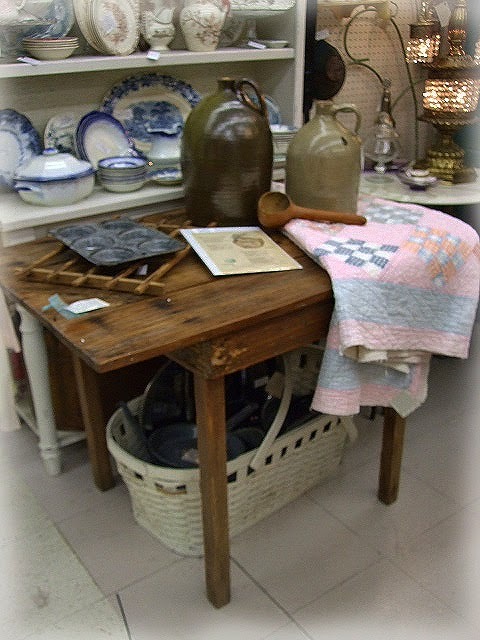 So many beautiful pieces are always found at Summer Place Consignments that I must drive down to visit sis on my next trip. 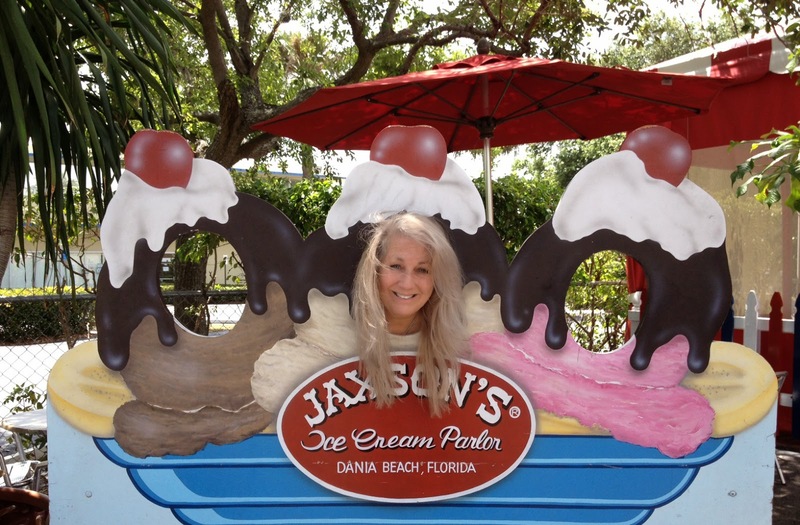 Next stop, Dania, Florida, known for its antique row and Jaxson's Ice Cream Parlour. 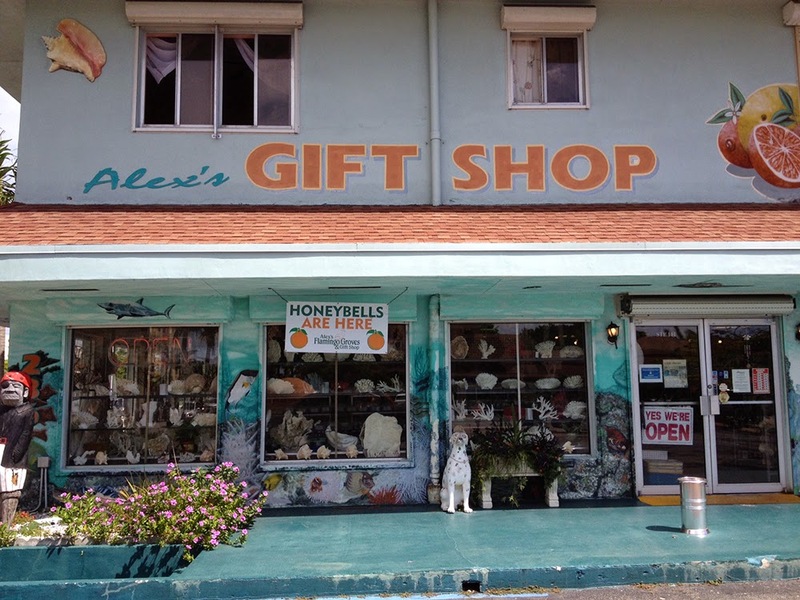 Most of the true Floridan fruit stand and gift shops have fallen away and Alex's is one of the last that still survives. 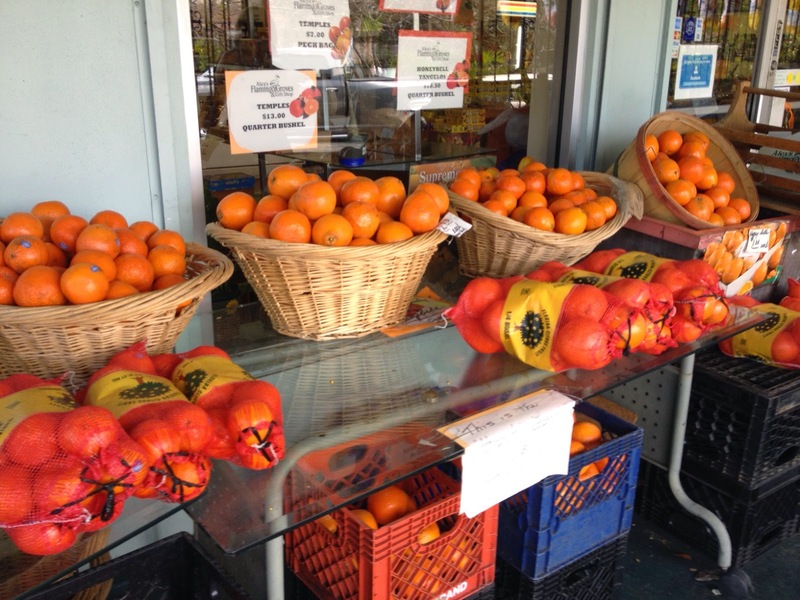 Family built and owned since the 1930s, you will find fresh squeezed orange and grapefruit juices at the counter. 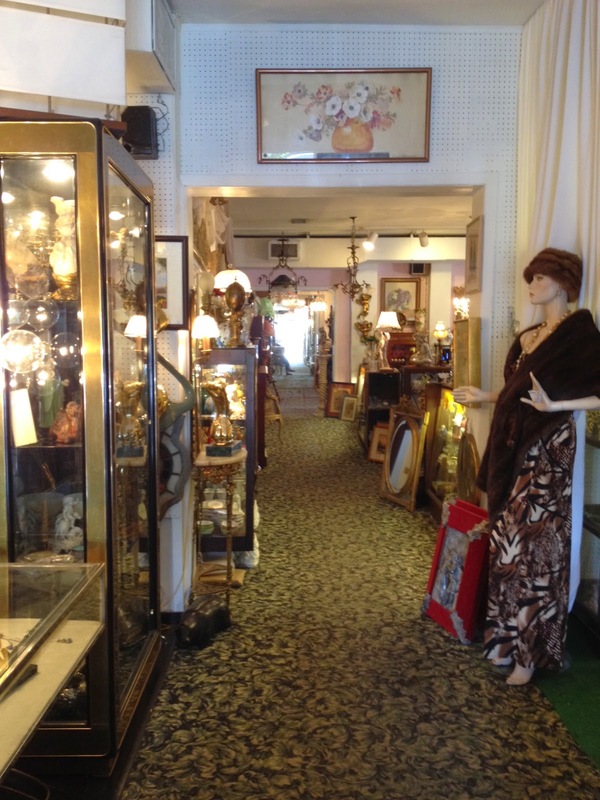 Next stop was Akiba Antiques, nestled in the heart of Dania. 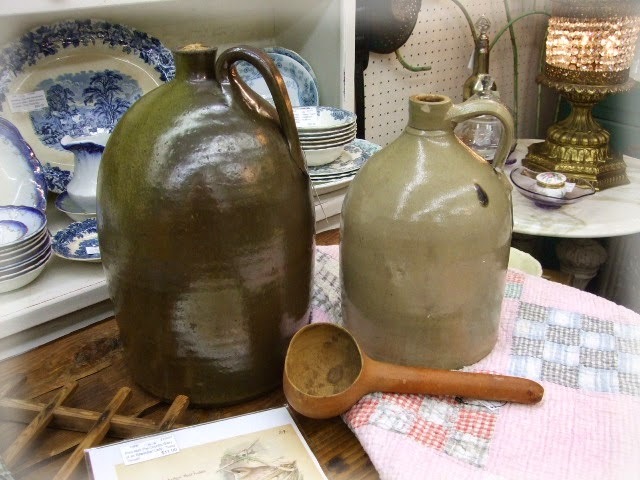 Akiba Antiques was founded by Charles and Franceska Akiba in the 1980s in Paris, France before migrating to the United States in 1995. The owners have painted the entire stucco/block building to look like a street in France. 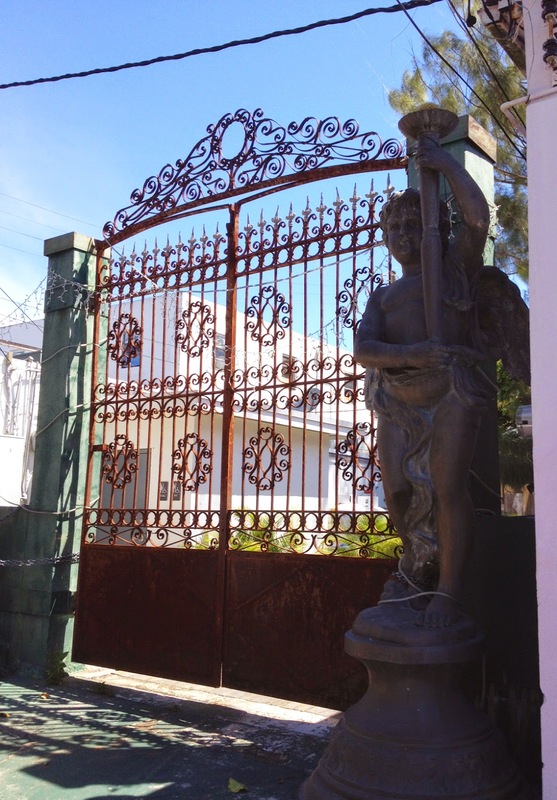 This magnificent iron gate and cherub guard separate the antique shop from the auction gallery. Sis and I were greeted by Franceska, and this lovely woman introduced us to the magnificent treasures held within. Like walking through a museum, the pieces were pure eye candy. Rooms and cases filled with treasure. Eye popping lighting, columns, statuary and art. 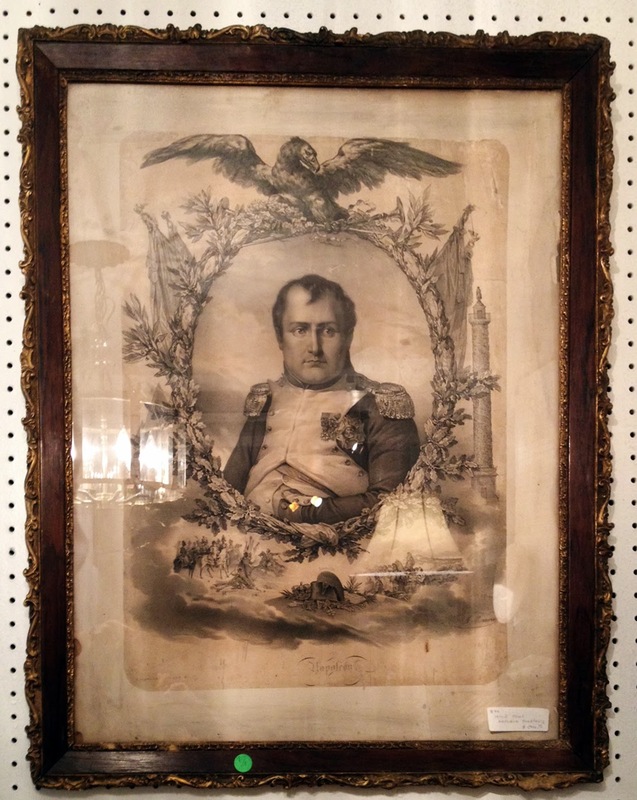 Fell in love with the engraving of Napoleon in original frame. Akiba is filled with so many marvelous historical pieces and Franceska was so kind to share their story with sis and I. Truly a family business, Franceska told us that the two shops next store belonged to her son and her daughter. Her son's store (I apologize I had forgotten his name) was a lovely as his parents. This amazing French doll house miniatures caught my eye. 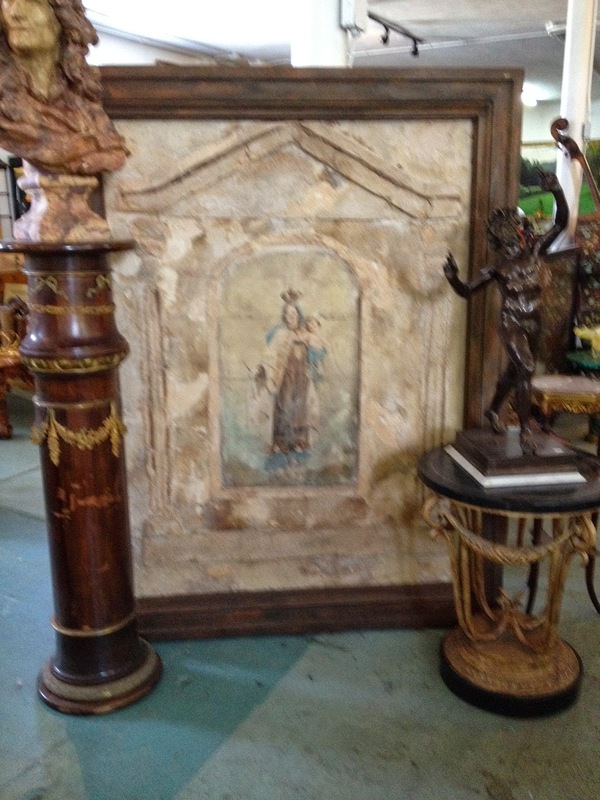 Gorgeous religious icon, column and bust, and marble tables abound and I could have taken them all home. From here we then moved on to the shop owned by their daughter, Sarah. Sarah is a lovely as her mother and her shop offers a completely different flair from her parents and her brother. Elegant simplicity with a unique marriage of organic pieces with antique decorative elements. Sis and I fell in love with this lovely little space. 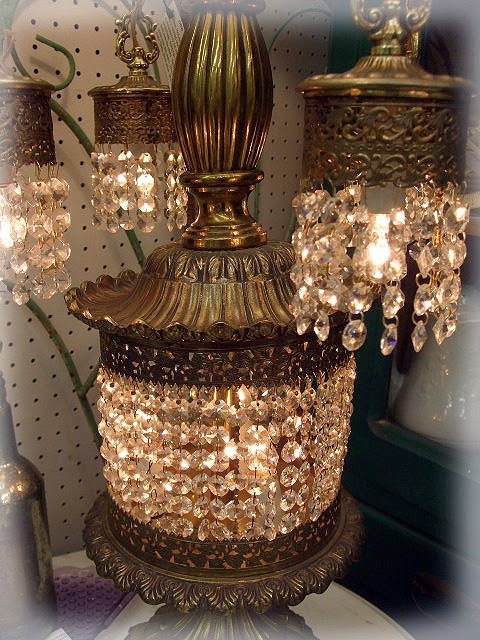 Beautiful lighting, I especially adore the prisms at the base of the lamps. 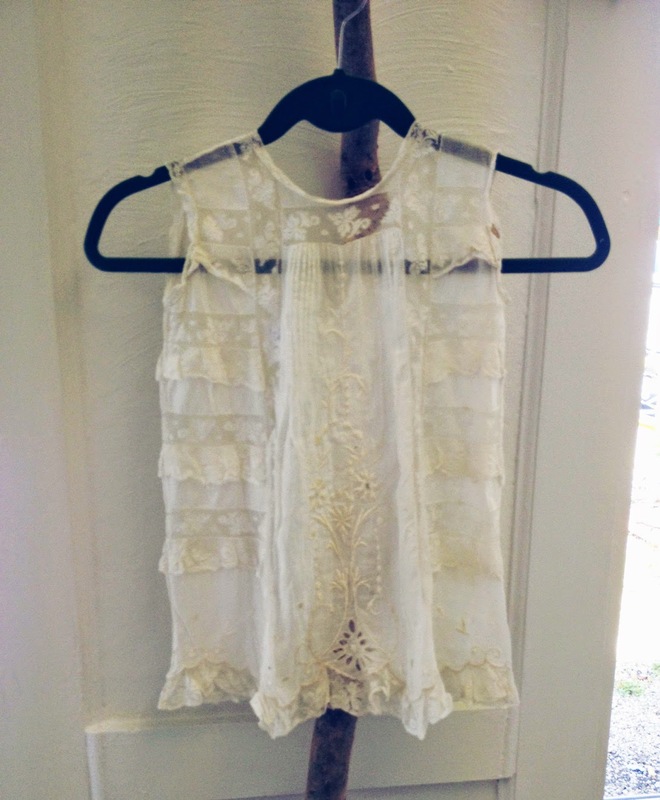 As everyone knows, I am weak in the knees for Edwardian whites and this tone on tone blouse is a beautiful example of hand embroidery white work and french fold techniques with fine lace. Sarah gave me a great price and this beauty came home with me. 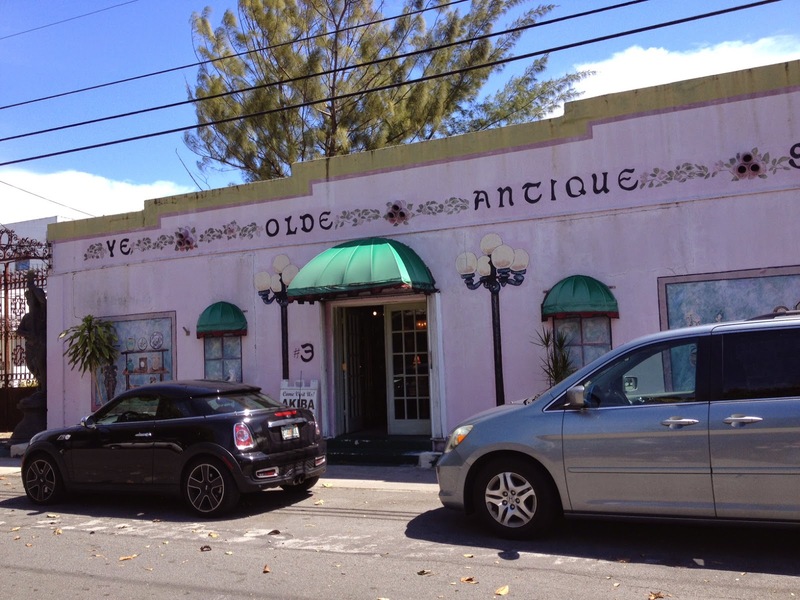 Antiquing works up an appetite for good ice cream so off to Jaxson's Ice Cream Parlor...one of the "must do" 50 places in South Florida. The ice cream is all home made daily and is out of this world. Only pure ingredients and the flavors are to die for. It's a small building and always filled with hungry patrons. 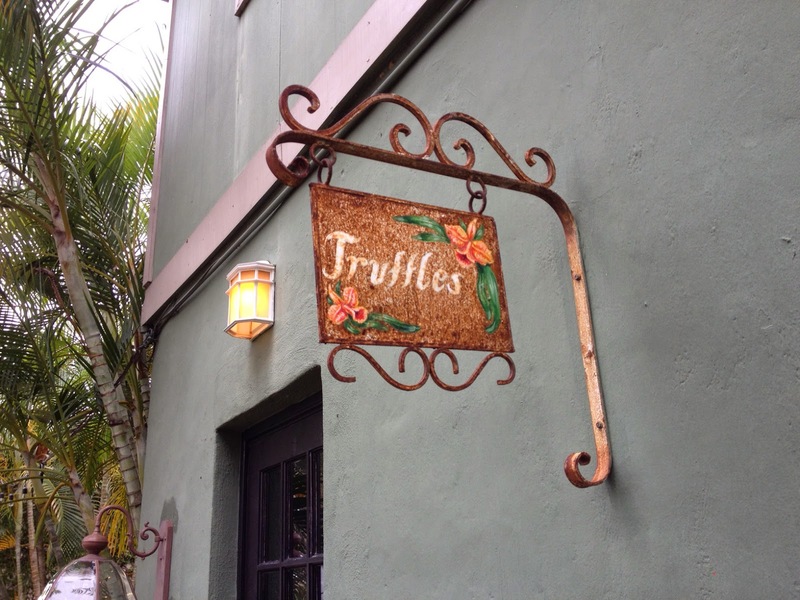 The food is delicious and the wait staff friendly and attentive. Following lunch at Jaxson's, sis and I decided to walk around Dania to work off the lunch calories. It was a splendid afternoon as we visited all of the many, tiny shops in Dania. 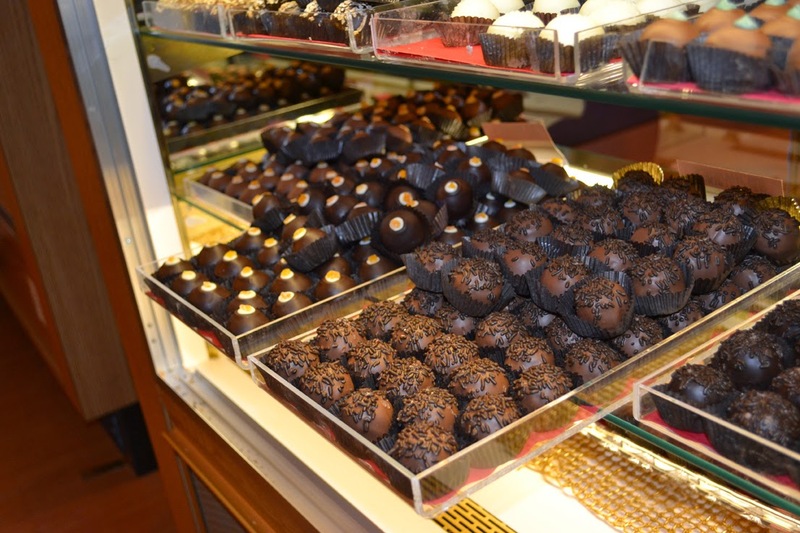 We discovered Jimmie's Chocolates and Cafe and had to go in for a handcrafted chocolate or two or maybe three. Yes, this sign was calling my name. 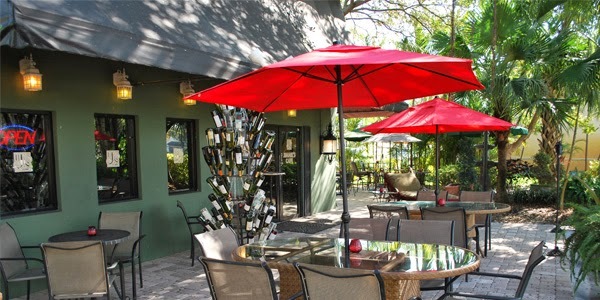 Jimmie's Cafe offers Bistro style dining offering a Continental with a Latin flare menu. 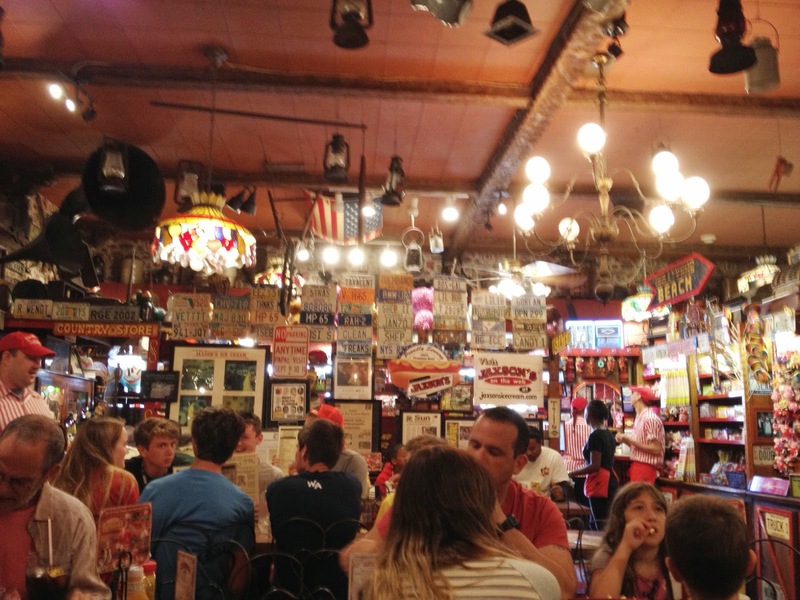 We didn't get to eat here, but this is on my next visit list, So much great energy about Jimmie's and the people are just so friendly and welcoming. The "real aromatherapy" Jimmie's hand made chocolates were intoxicating and sis and I made a small purchase to enjoy with a glass of wine at the end of the day. We spent the next hour driving back home on highway A1A which is the coastal road. You never make good time on A1A but you really don't care because it is rich with the ocean on one side and lovely hotels and homes on the other. All with people walking, riding bikes, skateboards, walking dogs, holding hands, laughing, conversing and rich with unique individuals only found at a beach setting. Sis and I had a marvelous day and we will make frequent trips to Dania Beach.